Perfect for cheerleading and gymnastics training, Discount Gym Mats are manufactured to the highest quality of workmanship. They are made of top of the line, cross-linked or PE foam core making them tough enough for professional or home use. These mats are commonly found in high school and university gyms across the country and around the world. Designed for durability and superior shock absorption, these are excellent multi-purpose mats. Not only can you use these mats for home tumbling and cheerleading practice, they are also great for gymnastics or martial arts studios. Use them at home for pilates or floor exercises. They are lightweight and waterproof so you can bring them with you wherever you need an exercise mat to spread out for your exercise needs. These mats feature 2-foot panels and fold accordion-style for easy storage and transportation. You can also use these gymnastics mats as wall padding. Simply screw the external flange on the long side of the mats to a firing strip attached to the wall and you’re done. 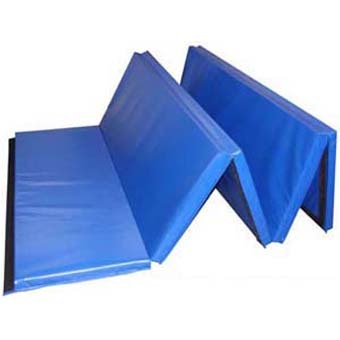 All of these discount gymnastics mats have hook and loop fasteners on all 4 sides and come with a thick, industry standard 18 oz vinyl cover. Each discount gym mat is hand-crafted with double stitched seams. Because they come with fasteners on all four sides, you can create an end-to-end run or build an entire floor by attaching mats at the sides as well as at the ends. At Greatmats, we stock Discount Gym Mats so they are available for next day shipping. All of our Discount Gym Mats are currently on sale and some sizes and thicknesses are available with free shipping. Please contact one of our friendly customer assistance representatives to determine which products will best suit your needs. Depending on the color and thickness, Discount Gym Mats come in either blue or black. Volume discounts are available. A quick note on safety: Tumbling mats and protective equipment are not a comprehensive solution for eliminating or reducing all tumbling injuries. Please understand that no mats are fail-safe. There is no substitute for proper instructions, spotting, and common sense when it comes to teaching tumbling or other forms of gymnastics. Landing on the head or in an out-of-control position can result in injuries despite the extra padding provided by mats.